Happy Monday! Hope you had a relaxing and rejuvenating weekend. After a busy week (please pardon my absence! 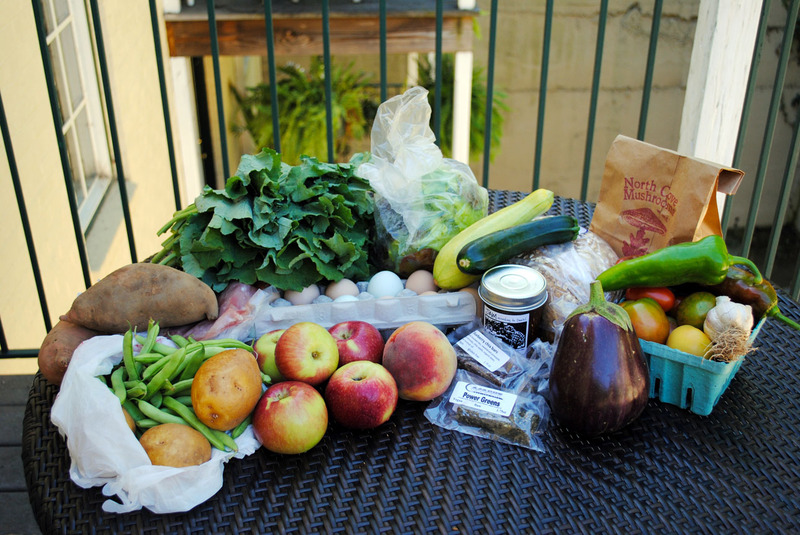 ), I had a great weekend, full of plenty of time in the kitchen, in addition to a lovely morning at the farmer’s market, a trip to the driving range, a yoga class, and an afternoon spent doing some work while my husband watched football with his good friend who came to visit. Last week, I realized that it’s been far too long since I enjoyed quiche! 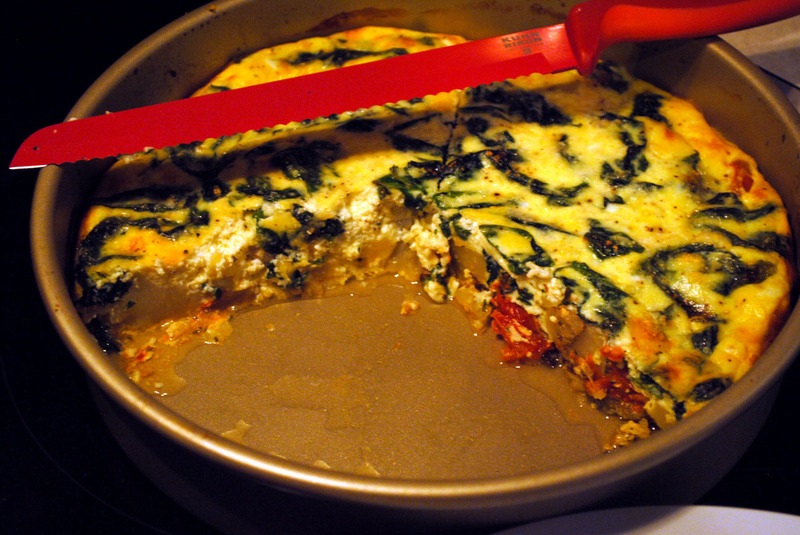 When I was young, quiche was my absolute favorite food, the dish I requested on my birthday. As a girls’ outing, Mom used to take us out to lunch at La Madeleine, and the quiche lorraine with a caesar salad was my go-to order. Quiche is a comfort food treat, bringing back good memories of my childhood. Unfortunately, my husband is not a huge fan… But when I saw this recipe from Erin, I just had to make a quiche. 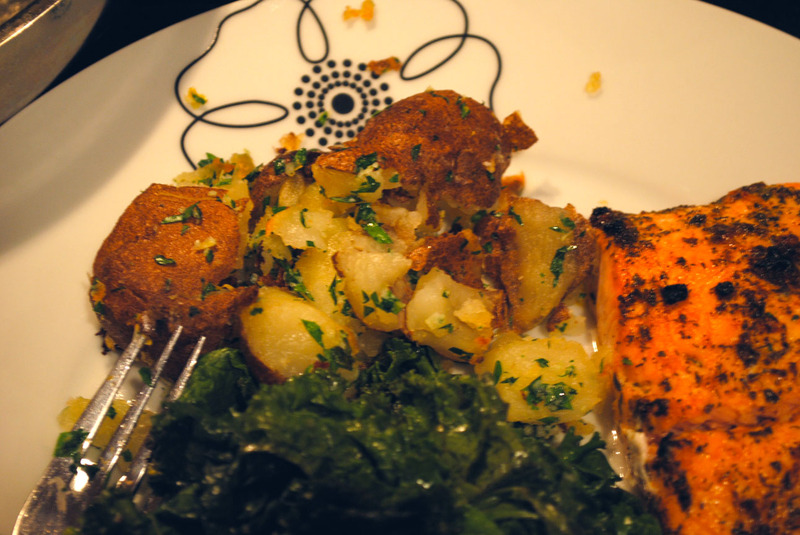 Over the weekend, I followed Jen’s recipe for Parmesan Gremolata Smashed Potatoes, served with broiled salmon and sauteed kale. I made a larger batch than 2 people could eat, and I had the perfect amount of potatoes left over to use in my take on Erin’s quiche. I also had ricotta cheese and tomatoes that needed to be used, so I decided to throw them into the mix, along with some spinach (because a meal is not complete without something green). I roasted the tomatoes with a bit of olive oil before layering them in the pan with the potatoes. 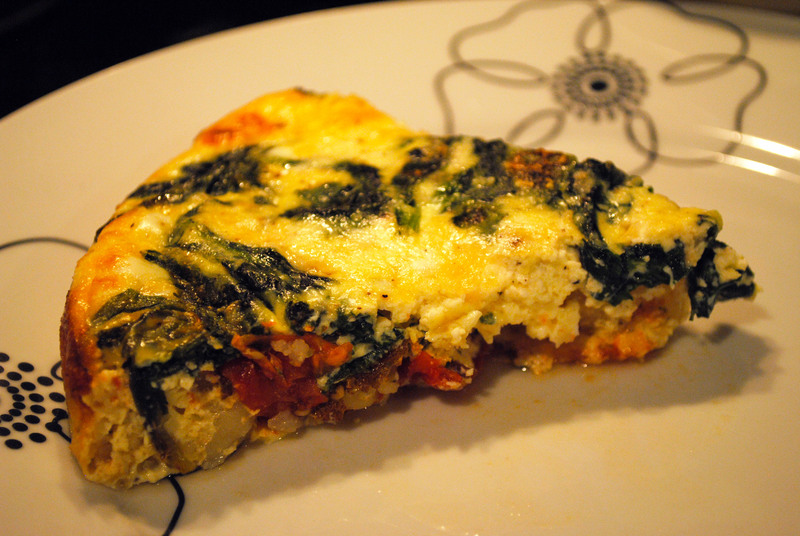 The spinach was lightly sauteed in a bit of olive oil and then layered over the tomatoes and potatoes. I poured the ricotta and egg mixture over top, and then popped this guy into the oven. Preheat oven to 375 degrees. Slice potatoes and tomatoes, and toss them with 3 Tablespoons olive oil, salt, and pepper. Roast potatoes and tomatoes for 20 – 30 minutes, or until potatoes are tender. 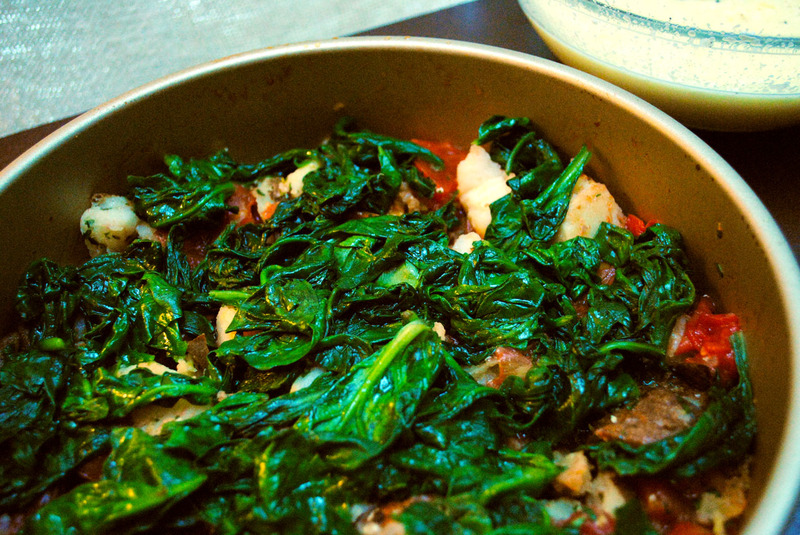 Saute spinach in 1 Tablespoon olive oil. Drain well to remove water. Whisk together eggs, milk, ricotta cheese, grated cheese, and pepper. Bake 40 – 50 minutes until top is golden and center is set. 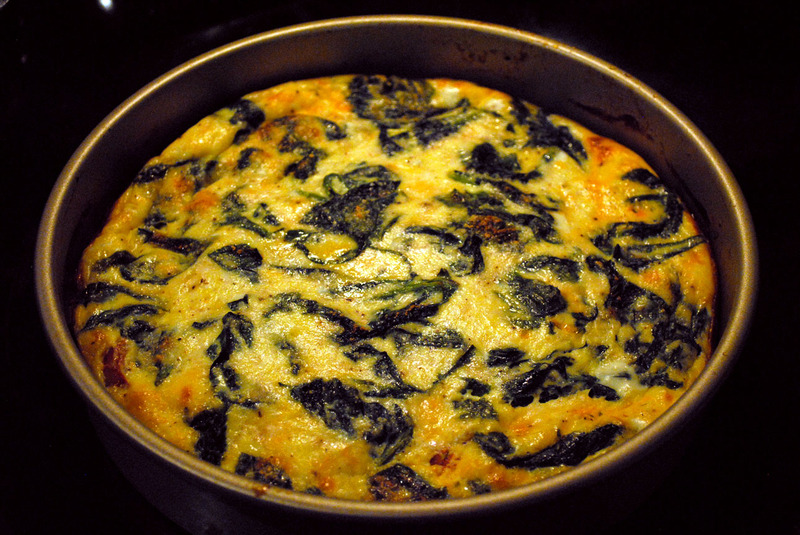 I enjoyed this quiche for three days in a row: two dinners and one lunch. The texture and flavors were great, and with the potato, I didn’t miss crust at all (though you could make this in a crust, if you prefer). While it takes a while to cook, quiche is simple to prepare, and makes for an easy weeknight dinner. Sadly, I have still not convinced my husband that quiche is delicious (he is a good sport! 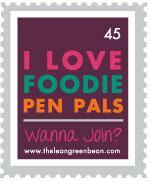 ), so it will remain an occasional meal in this house. Until next time, dear quiche.